Hello everyone! I’ve decided to update this post a bit. I’ve added some additional information, and hope to update with better images soon! Thanks for reading! Jade plants are my favorite houseplant, and are also one of the plants that I think I know the most about. I started with one or two of them, and over time that number has increased to the six Jades that I have now. Jade plant propagation is very easy! When I first wanted to propagate my Jade plant, I thought that I could take a leaf or cutting and just put it in some water. That is what I had done with some of my Ivy plants, so I figured that the propagation would work the same way. Needless to say, no new roots appeared and the plant cutting just died after a while in the water. After this happened, I talked to my mom (she is my gardening teacher) and she told me that all I needed to do was take a leaf or cutting and put it in soil. *Update: I’ve learned that a rooting hormone powder really helps with Jade plant propagation. My favorite is Green Light Organic. It’s pretty affordable, and seems to work well. So, all you do is take off a leaf and rest it against the side of the pot with the end of it just resting on the top of the soil. You don’t need to water it at all at first. I just water it sparingly about a week or so after sticking it in the dirt. You can start watering it more often once some roots start to develop. Starting a new plant from a leaf does take some time, but if you would like to have a larger Jade plant in a shorter amount of time, you can use a cutting from a healthy Jade plant to put in the soil. You may want to use the rooting hormone (as mentioned above), then stick the cutting into the dirt at least an inch or so; however much it takes to get it to be stable. If you don’t have rooting hormone, then I would recommend letting the end of the cutting dry out for a week or so before putting it into dirt. Again, water sparingly at first, and increase waterings as the root system develops. It’s important to note that Jades are notoriously slow growers! My mom’s Jade is about 2.5 feet tall, but it’s over 30 years old. So, don’t get discouraged if your jade doesn’t shoot up as quickly as you’d like! This technique should work with most similar succulents as well! If you have any questions, just let me know and I will be glad to give/find the answer for you! Like this post? Check out my article on How to Propagate African Violets! Previous PostFeng Shui with your Houseplants! As another lover of jade plants, I have also found that even sometimes when the leaves fall off (as they will eventually do) if they aren’t completely dead, most often they will just root in place and you can’t move them when you are “cleaning up”! That is how most of my jade plants grow big and tall. My Jade plant is HUGE. Do not want to split or destroy it in any way. It’s my BUDDY !! Needs a kind loving, concerned home. Needs ROOM and good light & living conditions. Hope someone can help !!!!! Amy, that is definitely something that I love about my jade plants as well. If taken care of properly, they are very hardy and will grow to very large sizes. Stephenie, I’m not sure if I understood your comment correctly or not, but are you looking for someone to take your jade plant? I understand how you feel, not wanting to cut or prune it, as sometimes I feel bad doing that as well. But if it is getting too big for your living space, you can just prune off small branches, and they will start you a bunch of small jades. The large plant will start to grow again from where you cut the branch off, it won’t die or anything. The node is where the leaf meets the stem of the plant. Just take a cut (make sure the piece you cut off isn’t too top-heavy)and stick it in the dirt! If this method doesn’t work for you, just try using a leaf. Please let me know if you have any other questions, and good luck! I have planted a jade plant leaf back in february and i keep it on the desk in my office. So far the plant is just a couple of centimeters tall but with several small leafs and the leaf used is still green and hasn’t died yet. Is it normal that it grows that slow? It is very normal for Jades to grow slowly, especially at first. Once it gets well established (and that original leaf will eventually die off) it will start growing a tiny bit faster. It seems like mine go through little growth spurts, so yours might just need a little more time before it inches its way up! It sounds like you’re taking great care of it! Please let me know if you have any other questions! I had a jade plant that froze. I gave it a little bit of time to see if it was still alive and determined it wasn’t. Anyway, I cut all the leaves off and have just some bare branches. The root system seems to be strong. Will it grow new leaves? Do I continue to water like normal? Thanks!! I have three leaves laying in dirt with roots but no shoots growing from them. Will a plant eventually start to grow? Hi everyone! Lisa, it should start growing new leaves eventually; you’d be surprised at how tough these plants are. Make sure that you cut off the parts that froze to avoid more rotting branches. Also, I’d suggest reading more about this subject at http://forums.gardenweb.com/forums/load/cacti/msg102007458567.html. Diane, jade plants do grow very slowly, but if it’s taken root, you should see a new shoot coming along within the next couple months or so. The main leaf you used will eventually die off. I have a pot with several jade plants in and three of them are bending over the edge of the pot. Should I prop them up or do they grow that way naturally? This is my first jade plant, my son brought is home from school for mother’s day. I don’t want to do something wrong and it die on me. Jade plants should stand up on their own, but yours could be bending down for several reasons. If the stem feels soft, then you are probably watering the plant too much. This will cause parts of the plant to rot, and you will probably have to cut the soft stems off. As long as you keep it in a bright spot and let it dry out between waterings it should do just fine! PS- Jades are hardy, so don’t worry about them getting too cold near a window. My mom has a huge Jade plant right next to a big glass window and they keep the house pretty cold; her plant is doing just fine, and actually the drop of temperatures in the house at night is causing her plant to flower! Hi everyone! I’m brand spankin’ new to the world of Jade plant owning. I bought one about two months ago, and ignorantly put it in t a pot with no drainage holes. Upon further research, I then potted it in a clay pot in regular soil. Now, my plant is riddled with rot, so I’ve cut it down and plan to take great care of it. I have the three stems sitting dry in two shot glasses on a shelf with lots of light. I put a leaf and two little baby stems directly into soil. What else can I do to save this poor plant from my destruction? Thank you so much for your time! Well, thanks a lot for the help, guys. My jade ended up dying. I threw it out. Thanks again…. Stephanie, I would love to adopt your jade plant if it is still available! Let me know. Hi, I took a leaf cutting out of my friends’ jade plant, but the leaves started wrinkling. why is this happening..? roots still haven’t come out yet. I need your help, I am worried my jade plant is loosing too many leaves pretty often. I only water twice a month. Some of the stems seem to be shriveling and dieing too. There is lots of new growth at the top and even sprouts coming out of existing stem. What should I do or be worrying about? I don’t want to loose my plant, it was given to me when my dad died recently. Please help me!! I have 2 jade plants that are beautiful. I leave them outside all summer long and they love the sunlight. Last fall I got stuck very late at work (1AM) and it happened to be the first night of frost. I got home and immediately brought the plants inside and over the next few days some of the leaves fell off. I left them in the bottom of the pot and one of them has turned into a new plant. The adult plants have small white shoots coming from the branches – they look like roots, but have been there since shortly after bringing them inside. What are they?? Please respond. Thank you so much. Wow, this has been a pretty active thread! First I want to say thanks to everyone for reading, and for your great questions and comments! Melissa, I’m sorry your plant died. It sounds like the rot may have been too much for it to rebound from. We’ve all killed a plant or two, but next time I’m sure your plant will do just fine. Leslie, sometimes it can take a while for roots to appear. I would try watering it a little more often. If this doesn’t work, you may want to try again. Cindy, one of my Jade plants have the small roots too. I think this just goes to show how hardy these plants are! Leaving it out in the cold is probably what triggered these tiny roots to start forming. If you’d like, you could certainly take a cutting of the plant; they would probably root very quickly! Hi there. I repotted my jade plant after I thought it had outgrown its pot. It looked healthy and strong on the outside and had grown over the edges. It had a lot of branches hanging over with many small roots from the leaves. But once I removed it to transfer to its new pot, the roots under the dirt were very small, fragile and short. I did repot it in a bigger pot and used potting soil thinking it just needed more room (and fearing I had been over-watering). I did some research and it seems that maybe I’ve been using the wrong soil all along. I’ve had the plant for nearly 10 years and have basically just watered it, made sure its had a sunny spot to grow in and haven’t had any problems with it. I’ve repotted it 4-5 times and I figured it was fine and just a slow-grower. It’s only about 15-18″ tall. I did not know what type of soil Jades prefer so I’ve always used regular old potting soil from the garden store. I read that they grow best in well drained, sand/peat mix. Is it safe to transfer it again so soon using the “better” soil mix?Also, is this best mix? Should it be 50/50 ratio? Or should I just leave the poor thing alone for awhile to recover? Suggestions? does anyone have experience with Echeverias? Do they all propagate the same way? I am having great fun making lots of jade trees, and I am starting to do the same to my other succulents, as well. I’ll let you know how it goes! and all the leaves are brown and dead. I have cut them off – is there any chance the central, thick stem may still be alive, and the root systems? Does anyone have any ideas how to test for signs of life and what to do now for the best? My friend’s mother gave me a cutting of her jade tree. the cutting is like 1 inch in diameter and very interestingly shaped, the stem is all twisted kinda like those twisted bamboos you can get at the garden store except this happened naturally because of where her window is and the spot i took the cutting from. anyway, she said i should just stick it in a cup of water, thats how she started her jade plant 3 years ago, though the cutting she took was massive it was more or less like half a bush that is now a tree. her jade is extreamy sturdy and she waters it around once every 2 weeks.. everything ive read says thats too much watering and that her method of propagation would kill the plant… but hers is massive and not squishy at all. is there some special cultivar that needs more frequent watering or anything? and i intend to go against her advice and treat my cutting like my other jades and let it callus. I recently got two free cuttings of a jade plant from a friend. She said to leave it in a dry place but not in direct sunlight until it roots. I put it on my kitchen counter on a plate about 3 weeks ago. There is a very small growth coming out of the bottom of the stem. Should I leave it where it is or put it in sunlight or plant it? And what type of soil should I plant it in when it is ready? I am very anxious to see this plant grow. It is the first jade plant I have ever had but I am an avid plant grower and I am always looking for new plants to root or grow. Please help. Thanks. You can get a cactus or succulent soils. These drain fast and are the best soil to in which to grow this plant. I have my jade next to a window, but away from direct sun light. Does anyone know how to take care of string of pearls? I have one and when I bought it it was a beautiful plant with flowers and hanging from the basket. Now they are getting dark green and mushy. Can someone tell me what to do to save it? I am open to any suggestions any one may have. I started a few new jade plants from cuttings, but they are just growing straight up. They look like jade branches sticking out of the soil. Do I need to do something to make them grow branches, or will they do that on their own once the baby plants get bigger? Hey, i just went to a greenhouse in my town with my science class, there i got acouple of jade leaves and was told that they propogate easily, the soil where i live is kind of sandy and it drains fairly quickly, is this ok for propagation? i have just put it in a pot and placed them on the side on top of the soil? i really want them to propogate. Is there anything else i can do to try to be successful? is there anything that im doing wrong? Many succulents CAN be propagated, but only if they are propagated properly. Echeverias, aloes, cacti, ect. CAN be propagated. In fact, not only succulents can be propagated, but begonias, rosemary, basil, roses, ect. can all be propagated from stem or leaf cuttings. Even blueberry plants can be propagated from a stem cutting! jen-you might want to. jade plants might not survive that long on a plate! just put the roots in the soil. Hi stephenie if you are still searching for a good home for your jade i would love to have it.!!! little roots after all… I know you said this is a long process, but how long is long? However, even regular jade plants tend to get reddish hues to the leaves, and this means that they are actually quite healthy! Are a lot of leaves getting spots, then turning yellow and dropping off of the plant? If that is the case, then you could have a problem. The dark spots could be from a number of different things. It could be from water droplets sitting on the leaves in the sun, which would then cause a dark spot on the leaf from a sun burn. Or it could be a type of fungal issue if your leaves are getting spots then turning yellow. If that’s the case, try cutting back on the frequency of your waterings. And to Binxy – I’m afraid it can take quite a long time 🙁 In my experience, my little starts tend to do better when they get a lot of bright light during the day. Keep in mind that if it’s direct sunlight, they will be okay, but you may eventually have to water it a bit more often. It’ s now inside but drooping and brown. The leaves are full of water and drip when I pull them off- Can I save it? What can I look for as far as “healthy” signs? I feel that it still has a chance- But have no idea how to proceed. Well, I would try to save a few cuttings if there are any that look like they are healthy enough to propagate. Other than that, just take care of it and give it some TLC, you would be surprised how well Jade comes back from things like this. last comment was for “free” who’s plant froze! Lots of great info on this page. Thanks. My daughter gave me a leggy jade about 4 years ago. Looks good, lots of good growth, but still kinda leggy. There are a lot of vertical shoots off the main stem, some have what look like rootlets. I plan to take some drastic action in about a month. The single main stem is about an inch and a half in diameter and there’s a nice vertical shoot about an inch away from the top of the soil. I want to make the main plant more compact, so I’m gonna cut the trunk there. Will the cuttings with the rootlets do better than cuttings without them? I bought a jade…… very tiny from the farmers’ market here in Kansas….we have as you prob know some nasty cold winters….so I put up a shelf on the east side of the house and hoped for the best….I also used a large fluorescent light and again…hoped….it is doing great!!!! !..it wintered over and is thriving….I only water her about one time a month…..thanku for the info on propagating can’t wait to get started!!!!! Hi, I’m in highschool and I am in a horticulture class, this is where I was first introduced to Jade plants (who knew I’de fall in love with them). Today I took 2 stem cuttings and 2 leaf cuttings and placed them ontop of a paper towel in an open shoe box to callous over. My research says they need a dim, dry area to do so, so they are in my closet with my light on (not very bright at all and not directly on them) and a heater on low so is stays warm but not scorching in there. I’m pretty sure I can handle the stem cuttings once they callous but I haven’t a clue what to do for the little leaftlets. Any advice? How should I make sure everything goes well in general? I found a Jade plant sitting in a glass jar of water on my back step. Of course I adopted the little thing. I started it in a little pot and have transplanted it to a larger one. It first started around 3 inches tall. It has grown intensely in the past 3 months and is now 9 inches tall. My problem is that I think the roots have not been able to get a good hold and it continues to lean and fall. I have stakes around it to try to assist. Is there a better method to get this thing walking on it’s own? Will, jades can live for years while being rootbound. I would not repot it again (to avoid trauma). Now that your little plant is in a generous-sized pot, I woulden’t move it at all! It will take a long time for roots to establish. Be patient. That’s cute how you found it on the back step! Do you have a secret admirer? I now changed my approach, I’ve plant them with rooting hormone but I don’t know how long exactly (weeks.. Monthes) it will take to develop a root system. And they’re still in my closet but directly under the light which I turn off at night and leave on all day. I have to say that this is a great thread and I am happy to have stumbled upon it. Now- I have a baby jade that I have surprisingly kept alive for a couple of years now. Recently it has gone through a growth spurt and the arms/legs have gotten long and hang over, the stems are not that thick and don’t seem strong enough to hold up all the weight. Should I trim them down or just let them hang? Also I was thinking about repotting it into a smaller pot now that I know they like to be rootbound, will that help the stems to get thicker? Thanks for all the great advise. Jade plant with split personality? I have had my jade tree for 10 years. It started only 5 inches tall and now it is 3 feet tall. Little by little I have been repotting it – always using regular soil and giving it Baby Bio. Last week, after 3 years in the same pot, I replanted it into a very large pot (75 cm tall and 60 cm in diameter), it lives in the sunniest place in the house (in the UK in a bay window) and I water it every 3rd week or so. BUT, after repotting it, within two days one of the trucks (there are two main trunks) all of it’s branches have totally bend sideways – nearly a 45 degree angle away from the window, while the other truck, always inferior, remains upright and slightly thinning out? What has happened? What should I do? Should I support and pull the branches back up? Its so weird how one truck is acting totally differently than the other? The trucks seem solid and strong but the smaller branches are a bit bendy? I have lots of jade plants – maybe I replant all of them into this new massive pot and they can “crowd” eachother? what do you think? I took a clipping of a branch off of one of my Jade plants, and two, or three leafs, I am wondering on how long it will be before they start to root? thanks! your info/pictures was most helpful – my grandsons love this kind of stuff and we will try your method – the pictures made it really easy! I’ll let you know how it works! I have several cuttings in small clay pots that drain. I had used rooting hormone and watering sparingly but its been almost two months and not a lot of roots have grown yet. Does it usually take this long for them to root? I know it takes time to see new growth but I’m just worried they aren’t rooting. I am using succulent soil as well. Any insight would be handy. Thank you for your information. Well I have had a Jade plant in a opaque plastic tumbeler of water for, I kid you not, probably 18 months if not more. I guess my sign of success was that the sprig didn’t die although it didn’t grow a bit. Last fall we moved it from the counter to a South window and for whatever reason this sprig has taken off. Now it’s just peeking out of the tumbler and has grown at least 1/4 inch in two weeks. The roots are meager to say the least and are hairlike in appearance and perhaps 1/2 – 3/4 of an inch long. Should I attempt to transfer the plant to soil, and if so how, or should I just leave it in the tumbler. It seems quite content with the current situation! thank u …the pictures really help. i was trying to do the same. i just planted the leaf into an other pot, n was searching for whether it works or not…u r post helped me to get a clarity…. thanks so much. hi, i tried the leaf method. But the leaves all seem to get soft and mushy. No roots. Should I throw them away? What seem to be the problem? my question involves prunning how old should the jade be, where exactly do i cut “above the leaf node” where is that exactly. i just bought my jade a few months ago, it was one annd half inches off the ground now its over two inches, growing every which way. is now a good time to prune back a little, or should i wait? I want to make the trunk thicker, eventually make the plant woody. I’ve had a jade tree for a long time- The thing practically grows roots right on the plant. Otherwise I just take a branch off (such as during pruning) and stick it into some damp soil. It has always grown from that. I’m not very good at pruning though 🙁 My plants are all wild and crazy! Actually, upon closer inspection of my babysat plant, it looks like one of the leaves already popped off by itself and is just lying on the dirt sprouting the two teeniest little roots I’ve ever seen. So that leaf is officially getting adopted by me now! I had one giant jade plant, but it got root rot and all but one branch died so i took the branch and with a clean knife cut the bottom off and placed it in a jar of water. please tell me this will root?? i’ve had the plant for years and now all i have left is a 4 inch branch with 5 leaves! any advice would be great!! Thanks the info has been helpful, I’m not sure what it is about this plant but I have always liked them. Hi quick question since i seen this page i started to grow out my jade plant by a leaf. For several months it has only grown bigger in root wise but nothing else seems to be happening. I water it ever other day. Does this take about a year or more to develop a plant or what? Thanks for taking your time to read this and please get back to me. Wow, thanks for all the comments everyone! Den: Jade plants are very slow growers. 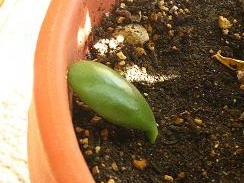 Over time, you should see a very tiny sprout begin to grow and eventually the main leaf will start to shrivel and die. I’ve found that it’s usually best to let them die on their own instead of cutting them off. I think the main leaf definitely helps to support the tiny growing plant. And yes, this may take a while. Jades definitely demand patience! Marly: I know it’s been a while since you commented, but I’ll answer anyway. If your jade cutting is still in water, I would move it into a small container of loose soil (either mixed with peat moss or perlite, any cactus mix would do). Keep it in fairly bright light, and water infrequently. Once a week at max, less is okay. I usually judge based on how plump the leaves look. If they look full, and don’t squish when you pinch them a bit, then the plant probably doesn’t need water. I received a few jade leaves and rested them in a clay pot just like you have but all of them seem to look wrinkled on the cut end where it should be callousing. I’ve only had them for less than a week…what should I do? Are they suppose to look that way or do they need a splash of water? NATASHA: I have been propagating Jade plants for years. If you just leave it completely alone it will grow. It does not need water right now. I dropped a leaf in a pot of soil about 6 months ago and it is 5 inches tall and has 3 other 1-3 inch plants now growing in the pot. The key is Literally to leave it completely alone. No water, no fuss. Don’t touch it. Just wait, and wait and wait!!! While subbing for the horticulture teacher in a local high school last May, I brought in my jades to split and repot them. I saved a number of healthy leaves when i took them off, put rooting powder on them, and planted them to create more plants for the class. The surviving leaves (12 or so) have doubled in size and are very succulent and healthy but have no new plants growing from them. It’s been about 9 months already. What can we do to encourage the growth of stems? Note: they are in the school greenhouse and are tended by the students. I am curious to know if the people who left the jade trunks in water ever had success. I just had a 1″ diameter trunk with four branches fall off of my jade and want to know how to save it. The base where it broke off looks perfectly healthy (i.e. : no root rot), but it is about 12″ tall and too big to stand on its own to just stick it in soil. I bought a plant a few months back during the summer and it was pretty verdant, real leafy. Over time, leaves just kept falling off and I asked the lady Ibought it from about watering. She said it takes a while to find the right balance. I loved and owned money plants since I was 13 (I’m nearly 23 now) but my success and knowledge hasn’t improved much over that time. However, it is now sitting in a mix of grit, regular potting soil and perlite and is still losing many leaves (almost looks bare) with loads more tiny leaves and stems shooting from tips. It isn’t in a sunny spot where it is too big to fit at my windowsill so only every now and then I put it at sunlight and am sticking to its water-once-a-week rule I have for it. My newer Jade which I have bought from my friend’s workplace, is looking real happy in comparison. It was squidgy to the feel but healthy in appearance, and as soon as I repotted it and put it at my window, it started growing real fast. I water it once a week like my feeble-looking plant and it is in the same mixture of perlite, grit and soil. I spray it with a misting bottle twice a week (which my mate has done with his Jade which is fairly big, VERY leafy and bushy, and healthy, just over a year old) and so far no issues with it. Any further information and advice you can give me specifically, mostly to aid in my bigger plant’s recovery will be very appreciated. P.S. are there any conditions in which a plant is kept that determines their bushyness/shape? Like if I wanted a bush-like or a tree form of a Jade? Thank you. On an additional note, I would like to add that I water all my plants, regardless of species, mind you, from the bottom so that the roots draw it in, encouraging the roots to grow, thanks to geotropism. I mention this in case it makes any difference to my plants’ health and as possible advice to other readers. I have a lot of little jade plants but they are all a bit brown and corky and so I am trying to propogate them. I have some stems that have got a callaos on them and a few mini trees like 15cm high! What should I do? How can I propogate them from this stage (they have a calloas)? Anyways. They are about a foot tall now & are growing straight up. No side shoots or anything? Can I train these? Or should I support them? I’m a little confused because my first jade that I started, I did put in water and it DID start to grow roots. I then put it in dirt and 4 months later, it’s about 4 inches tall. I’m trying to start baby jades for a plant sale this weekend (I started 1 1/2 weeks ago) and no roots. I have put them into a sunnier location hoping for something to happen this week… Any ideas? For those of you that have tall Jades that haven’t branched out, try pinching them off at the tops. They should then start to branch apart! For more info and photos check out the forum post HERE. Ash, it sounds like your Jade isn’t getting enough sunlight. Either that, or watering once a week is too often. I usually say that if you gently squeeze the leaf of your Jade and it feels firm (full of water), DON’T water it. Only give it water if the leaves feel soft. I’d say to use this tip, and start cutting back on the water. If it’s still losing leaves after a while, then it will need more sunlight. I have just discovered your web site and in awe of the questions and answers you have provided. My jade(s) are at least 12 years old, taken from a plant that was growing outdoors on the west side of a building. I took 3 cuttings, put them in one pot and (to my amazement all three have grown. They are now in a 12-13″ pot sitting in a north window on a plant stand, They have started drooping down and then turning up again. They also appear to be root bound in the center of the pot (from the much smaller pot originally, and I am wondering if I could take them out, wash all the dirt away and separate the roots into 3 plants with out killing them. I was novice and darn lucky in that they even lived way back then. I would hate to kill them now and do plan to make starts from some of the branches to donate to a DAR yard sale. I did use root tone and really lucked out. Can the curves in the stems be straightened out with stick props?? Do I understand correctly that a cutting needs to dry out before planting – if so will root tone do any good at that point? Hi there. I’ll be moving in a few weeks and have about a half dozen jade plants that I’ll be taking with me. They range in size from about 10 inches tall with a 1 inch trunk to tiny starters. Any suggestions on preparing them for the move? Thanks for any advice! p.s. congrats on the now 5 year running thread! Thanks for the response Jocelyn. Of course my jade has already reached severely critical condition a while back and has just kept getting more and more wrinkly and I have watered it less. All the branches have fallen off or just wilted and shrivelled. I figured out the pinching technique a while back on my own with my smaller Jade and it is doing very well. It has grown considerably larger in the past couple of weeks. My dying/dead plant has dropped a few leaes before it started properly wilting and many of the leaes have started to root, so its death won’t be entirely in vain. I have an eighteen y/o jade plant that unfortunately fell over and broke a large part of it off. I put the part broken in a pot of soil. The place on the trunk is exposed and I wanted to know if I need to put anything on it to seal it from bugs and such? Thank you for your help. Sheila, I’m no HUGE expert but a thin plastic bag wrapped firmly around the base of the pot should help as well as trap in moisture that the soil could re-use. Make sure not to prolong its position in sunlight or else it will burn. If you are keeping the plant indoors not too close to a window, then you probably will not need to worry too much about pests unless it is placed next to plants that have been outside for repotting, etc. Ihave a great jade but I am concerned as to whether it should be repoted, the stems are resting on the pot and there have been many more wrinkled leaves than ever and some of them are sticky, I realize that it has been watered to much. I read that it needs more drainage and some bone meal when I do transplant to a larger pot. any hints would be appreciated very much. I got several cuttings from a very big, very old jade. I just stuck them in a baggied with some slightly moist soil – not knowing that too much moisture is bad for jades – for a cross-country flight. After I got home, I read up on jade clippings. So, I let the ends callous and after about 10 days, got the root hormone and potted the clippings in soil especially for succulent plants. I didn’t water for a few days and then misted just the top of the soil. Now, some of the leave have been turning yellow and shriveling up. Is there any hope for these clippings? My succulent starts molded! what did I do wrong? They were not in the sun, I used cactus soil, and the root hormone you suggested. Any tips? Thanks! I mixed blasting sand(it’s used for sand-blasting), vermiculite and soil to re-pot my jade that sounded just like yours. I had decided it wasn’t draining well just like you. The more sand you add the faster it will drain. I water a little bit daily, but it drains very well. I water all my plants with half the recommended amount of Schultz 10-15-10 Plant Food Plus and most importantly,a slurry of my coffee grounds daily. I drink the coffee and then add as much water as there was coffee to the grounds. I also grow ponytail palms, birdnest ferns, and ming aralias. They all get the same treatment, and when they behave, I give them all a hit of the real coffee. Hope this helps. Update for my cross-country clippings… I left them alone and the leaves continued to shrivel and drop. The soil looked so dry, I thought that maybe they really did need water – and at this point, I the damage may have already have been done. So, I wet the top of the soil ever so lightly once a week – careful not to wet the plant, only the soil. I’m thrilled to share that there is new growth on my jade clippings. I couldn’t be happier. These cuts were made from a giant plant owned by a dear relative who passed. My Jade started drooping! I don’t understand why, I moved this summer and now have a balcony and when I put her out, she was growing beautifully and getting new leaves, etc. ; she loved it! I brought her in, because it started getting cold and now she started to droop and I notice now some of the leaves getting brown around the border… What should I do? Have you seen this before? I will get some new soil today and check the roots (she was super dry, but I know not to overwater her), so that is the only thing I can think of from what I have read, although I am not convinced I should report her at this time of year. Would be great if you could share with me your expertise to save my Grandfather’s Jade, which is one of the few things I have from him!! hello. well my jade stems that my sister inlow have me. are falling apart,and after reading all of the above i understand that i’ve been overwateing it.but can i do something to recover the fallen stems? I have been growing jade plant leaf cuttings for my wedding favours. I started growing most of them back in sept 12 and have recently planted some more as some of the previous ones died. I wanted to know how long roughly would it take to grow a small 2 inch plant from leaf cuttings? Quite a few have stems and leaves sprouting but my worry is the rest won’t catch up and I have 6 months to go now. They were in the conservatory with uk winter climate but I have recently put them in the spare room by the radiator and noticed they seem to be growing more. Rate of propagation does usually depend on the size of the cutting. Winter conditions and lessening water tends to make money plants flower so keeping them in the cold (away from frost though, of course) would not have harmed the cuttings. I have not posted here for nearly a year now but my money plant I bought from my friend’s workplace is still healthy and growing very nicely! So long as they are getting plenty of sunlight and watering only when the leaves feel soft, and the soil has a higher drainage, your plant should thrive. I keep my plant in a compost mix of roughly 50 – 60% compost, 30 – 40% gravel and the rest in perlite. I have a jade that is 8 feet tall and about 8 feet wide which is growing beside a pool in a southern California Dessert town. Can I cut up the plant into 4 foot long stems and put them in pots located in Pasadena, CA. The area I am moving them to is a very hot patio area. (I had pigmy date palms there which died from the heat). Should I remove all the side branches from the stem and insert about a foot of the stem into the dirt with root hormone? Does anyone have experience with propogation from large branches and not just from the leaves? Thanks for all your advice in propagating and trimming and growing jade plants. Did someone say their jade plants flowered? I haven’t ever seen a jade plant flower. Maybe I mis-uderstood the message. Do yours flower? I have a good sized jade plant. On a few of the branches of the plant roots have shot out under the leaf where the leaf meets the stem (the node?). Could I cut the plant at that point and plant the top part of the branch with those roots? What will happen to the bottom of the original branch if I did that successfully? Thanks! I personally don’t use root hormone or any of the like. I just let it come naturally. The same money plant I bought as a cutting around the time of my first post last year has thrived and is going through an immense growth spurt just by being at my window Beautiful plants, I’m so glad I bought that shrimpy little cutting last year =P but Jarrett, to answer your question, most gardening stores or supermarkets that sell some gardening wares during spring and summer will usually have some in their gardening section. Vickie: My jades throughout life have never flowered, no, but once you learn what conditions your plants respond to, then yes, they flower! Type in money plant, jade plant or whatever other names you can think of in google images, and you should come across pictures of a large plant in bloom. From what I gather, they usually start flowering after their second or third winter if conditions are right, younger plants are less responsive. Sara: Yes, closest to the leaves is where you should cut the stem/branch of a plant. It is good to do this during the most active time of the plant’s growing stage – in the Summer. This will also act as pruning to the main plant, and having a small part hacked off encourages the trunk and branches to thicken and support more weight, in turn sprouting more branches where it was cut and triggering a response to grow more branches in other parts of the plant. My plant has not been pruned at all but it has been growing very nicely on its own. Val: I have kept Jades for 11 years now and the one I got last year is my first successful, healthy one. It’s a matter of practicing until you find the right balance of water, sun, soil mix, etc etc. High drainage soil works best so you can flood it during watering, but allows it to take as much as it wants without drowning. Regular compost can work very nicely, but once it roots, make sure it goes into soil that lessens over-watering. Hi, I keep reading about sticking a jade plant leaf into the soil and let it root. I’ve tried that many times and the leaves just shrivel up and die within days. I’m not sure what I’m doing wrong – am I supposed to not water it? I have 3 pots of jade plants, and leaves occasionally drop, so I just want to make use of them. Thanks! I have had a start to a jade plant for awhile now and it had started to go roots while sitting in water, then me son had knocked my shelf and it tipped over removing the roots. I put it back in water and nothing has happened. I was just wondering if i should let it dry and put it in soil or to just put it in soil? Please let me know. Thanks! Carl: I too am making my first (recent) attempt to propagate a plant from a cutting. What I am doing is keeping the soil dry most of the time, but pouring a tiny bit of water over the top every few days and putting the stem of the cutting back in. I’m hoping the water will eventually draw roots and drinking it until the leaves plump back out and the plant grows. Chyenne: Never put cuttings in water. Jades are a succulent and therefore do not like extra water. They should be put in dry soil from the start, watering only when they appear to be sprouting roots. Update to my last post – my cutting has grown roots! Seems my first real propagation attempt is a success! I have 4 Jade plants in one pot. They are almost 2 feet tall. They are getting too big for the pot. Shall I get anoother great big pot of pot them separately? Also, if they look like they are getting top heavy what shall I do? Do I need to stake them up? I have about 15 individual Jade plants. I would love it if I could get one to flower. Any tips on that? Hi, I have a jade cutting that I’ve planted. I mixed my own soil with mostly perlite a bit of sand and some well draining soil. I made a little incubator for it with a bottle and I used rooting hormone as well. I planted it 6 days ago now and I was just wondering, is it normal for the leaves to drop while it is rooting? One fell off yesterday and today two more. There’s 3-4 level left on it. I was given three Jade cuttings. I put them in water and all have long white roots. Two of the cuttings are about 12″ long, with healthy leaves and tiny roots along the length of it. Since the cuttings have wet ends and were not set out to dry nor did they sprout from leaves, will they grow if I just pot them straight from the water jar? What is the best soil in this case? have three large cuttings and want to root them in water do you advise this or will their thick stems rot?